How do you prepare when faced with a large pile of marking to do? Marking – don’t we just love it? Half-terms, the Spring break, Christmas and summer holidays are a perfect chance to get away and think about yourself for a change. To take your mind away from the stress and strains of classroom life, yet, it is never really that simple is it? As teachers, we need that time off to recuperate and gather our thoughts; to get ready for the next set of challenges that lie ahead when we return to school on the first Monday morning of a new term. However, despite all our best intentions to rest, we all know – or assume – that what each of us has been doing, is blooming marking and the need to catch up! How can we rest and catch up with workload when the ‘workload balance’ is wrong from the start? Your own well-being is critical here and the recent findings of the Workload Review Groups – particularly the marking group findings – have provided us all with some vital recommendations. The impact of your marking can be significantly beneficial to the children it is for. We know this, but what can we focus on so that we are working smarter – not harder – to have greater impact on the student? In my short teaching career, I find that marking for a new term – whether this is before, during or immediately after a holiday period – is a great way to look back at the starting point of children’s books. It’s offers a signpost of progress and action needed for the term ahead. To review what progress students have made, what they have learnt, what they have forgotten and what path you need to take them on next. It’s a great way to see for yourself what YOU have taught them. A feedback technique I have found useful when marking for the new term, is to look back at student targets from the previous term and try to specify why they have ‘not yet’ achieved targets set. Being a reflective practitioner really helps. If you find easier to mark at home like me, and I know books can be very heavy to transport, a quiet place at home often allows you to focus without distraction. We all have our own preferred space and time to work. Whatever this is, make sure you have a break from the monotony of routines. As teachers, we have our lives dictated by timetables, school bells and deadlines. It’s very easy to feel like we are plodding along on a treadmill. Break up that routine of marking at the end of the day. Try first thing in the morning? Perhaps mark books in the garden on a sunny day? I doubt this will be effective and a huge distraction, but if it works for you, then great. Schools marking policies also have a big effect on the way a teacher can find themselves marking for the new term. Literacy and numeracy has such a big emphasis within education and in the curriculum, that it is easy to focus on grammar and equations before other marking can take place. 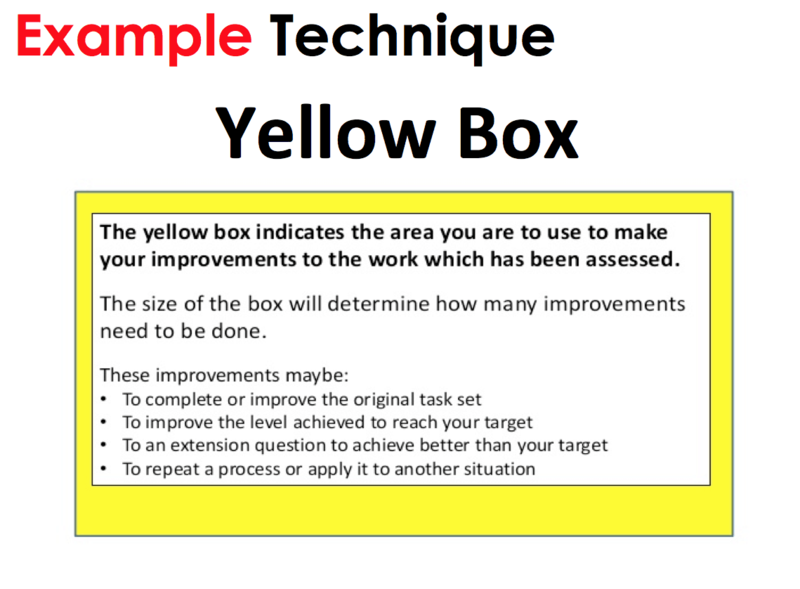 This is why ideas, such as the Yellow Box are perfect for reducing workload and zooming in on feedback areas for improvement. Obviously there are other things to contend with: ensuring other areas of the curriculum are planned and assessments are up to date; lesson resources are in place for the new term and the classroom is ready for the new term. But, last but not least, ensure that YOU are ready for the new term. Have you thought about yourself? Have you had that break before returning to work? Did you decide to put yourself first before that facing the pile of marking? I know I have, and I feel a lot better about it. Why not give some of the strategies below a try this term? My tips for getting marking ready for the new term. Try 12 ways to embrace marking and feedback. Make a timetable for the week(s). Attempt your marking somewhere else; not at school … you spend enough time there! Try 10 marking and feedback ideas. Look at marking with fresh eyes; try late morning/afternoons. Prioritise – which marking is the most important? Get up to date and never put it off. If it’s not done by the final weekend, before the holidays, leave it. Have that final weekend to yourself! Try Smart Assessment? Enjoy yourself. Marking shouldn’t be stressful over the holidays. If you’re getting anxious, take a break … you’re probably losing sight of what’s important. Jack Gulston is a second year primary teacher and writes for Teacher Toolkit. You can read more of his articles here and can follow him on Twitter at @JGulston90. Teacher Toolkit: Helping You Survive Your First 5 Years in Teaching. ← Do You Want To Be A Headteacher? Jack writes for the Teacher Toolkit site from a primary perspective and is in his third year of teaching. He worked as a teaching assistant in a special needs school for 3 years before going on to complete his education degree. He is currently teaching in year 2 and works in a school that is in an area of high-deprivation and high social-mobility. Good read. I’m always looking for ways to make my workload manageable.